It might seem like we review a new pair of headphones every week. As far as we’re concerned, you can never have enough selection. Just as your taste in music is personal, so is your taste in headphones. There are so many different types of music we listen to, just as there are many different environments that we enjoy the music in. We’ve seen some lightweight wireless headphones that offer superior portability, and we’ve seen huge ones that offer the best possible sound quality. Every manufacturer seems to have an edge, but it can still be challenging to find headphones that are simply great all-arounders. Everyone’s had struggles with earbuds in the past. The ones that sound good are massive, but the ones that are designed for sports are disappointing. Finding a pair of headphones that are both suitable for your athletic style and high quality can be a pretty big challenge. Recently, we’ve seen some major improvements to the Bluetooth platform. Modern headsets are coming out that have better battery life, more compact form factors, and even more impressive sound quality than their predecessors. Treblab would like you to think that their latest pair of headphones checks all these boxes, but let’s take a look at see how they stand up in the real world. 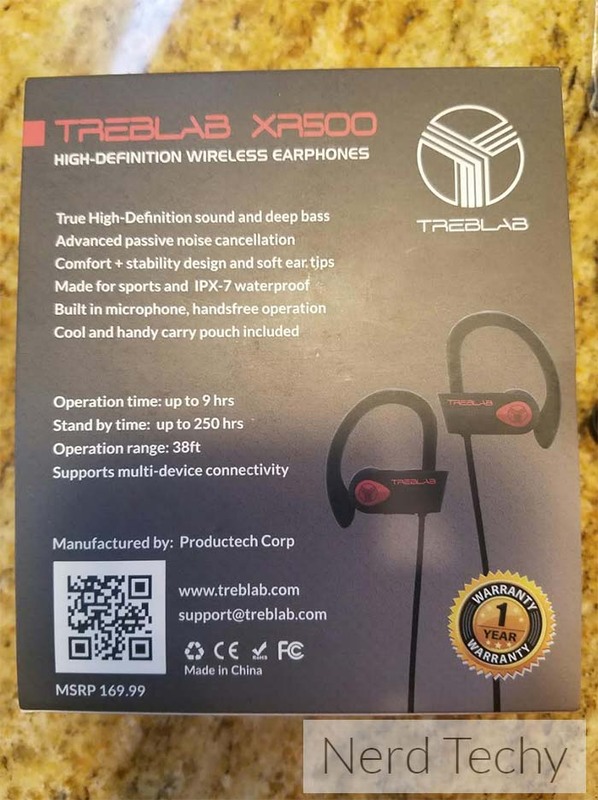 They say don’t judge a book by its cover, but at first glance, it’s a thumbs up for the Treblab XR500 Bluetooth Earbuds. They’re a tad larger than most classic earbuds, but that has to do with how much more they have to offer. And don’t be fooled, they are very lightweight and stylish so you can listen to your music on the go without worrying about how your earbuds look and feel. These earbuds are designed with music lovers on the move in mind; they come with over-the-ear clips that keep the buds in your ears even while you’re exercising. 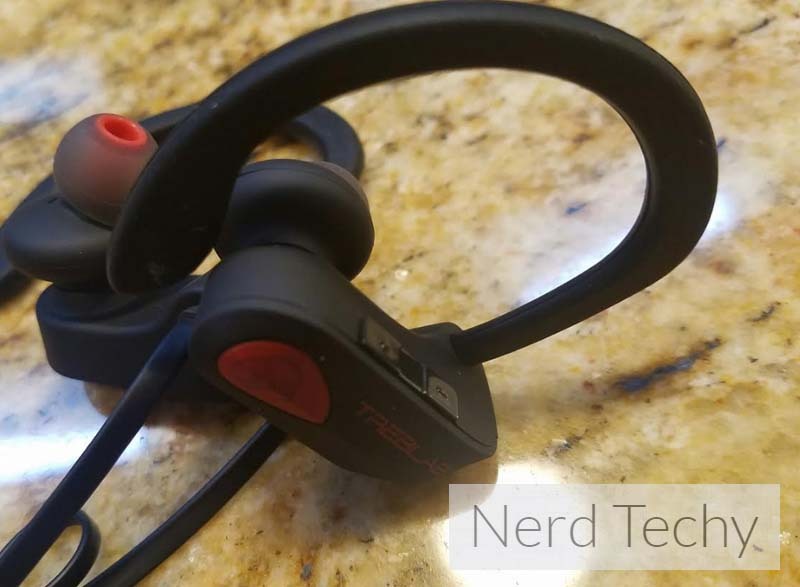 Runners and gym goers will love this feature, as they negate the need to constantly adjust your earbuds or try to prevent from falling loose and tangling. That means you can focus on the more important things at hand; namely, your music and your exercise. They also come with an HD microphone, and also volume, skip, pause and play buttons so you can easily answer and manage calls and volume control without pulling out your Bluetooth-enabled device. The ear inserts are made with soft rubber so your ears won’t get sore from extended use. That makes your 3-hour hike or 5-hour plane ride a lot more manageable, and when you finish a workout, who needs another sore body part to complain about? We haven’t even got to the best part, which is their no-tangle cords. Thanks to their Bluetooth connectivity, there is far less cord to worry about which means easier transportation and seamless use. No more 10 minute delays at the beginning of your run as you try to untwist the earbuds you just pulled from your pocket and swore you folded perfectly last time. In a nutshell, they are perfect for athletic and on-the-go users; comfortable, stylish, durable and tangle-free. It can be extremely difficult to find earbuds that offer good sound quality. All too often, earbuds sound tinny and distorted, making it difficult to enjoy your music. What good are compact, portable speakers if they are unable to do your music justice? 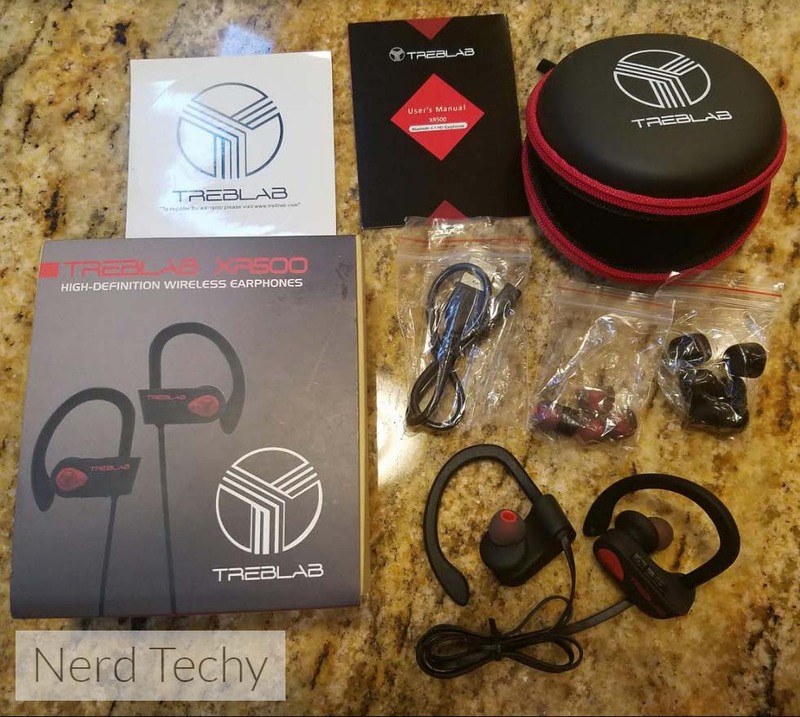 Treblab made sure their XR500 Bluetooth earbuds would offer excellent sound quality without sacrificing comfort. They boast high definition, full sound range with solid, booming bass and crystal clear treble. Their Bluetooth communication method delivers your music uncompressed, so there is no degrading as the sound transfers from your device to your ears. They’re compatible with any Bluetooth device, so you can use them at home with your computer or on the trails with your phone. The Treblab XR500’s are designed to fast track your music right to your ears as clearly as possible; the soft, comfortable ear insertions are expandable to seal in the sound so you can enjoy every beat. 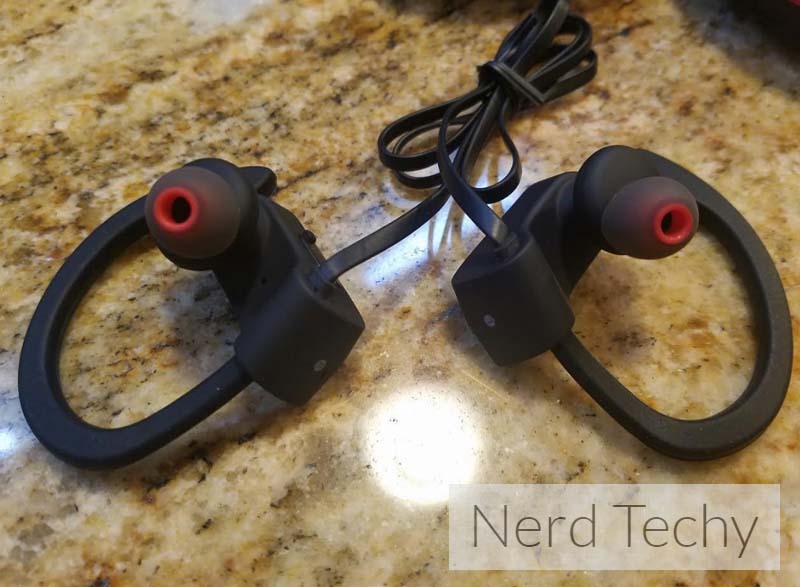 They even come with passive noise cancellation so your music isn’t disturbed by noisy surroundings (think the incessant pop music they insist on playing at your favorite gym). High quality sound combined with noise cancellation is hard to come by on the earbud market, making the XR500 earbuds a step above. If you’re shopping for earbuds, there’s a good chance you’re searching for headphones you can trust to get bashed around a little. You can’t beat the sound quality of premium quality over-the-ear headphones, but they can be bulky and prone to damage in many scenarios. One of the greatest advantages of earbuds is their compatibility, so why waste money on earbuds that won’t survive a trip in your carry-on suitcase or running-shorts pocket? 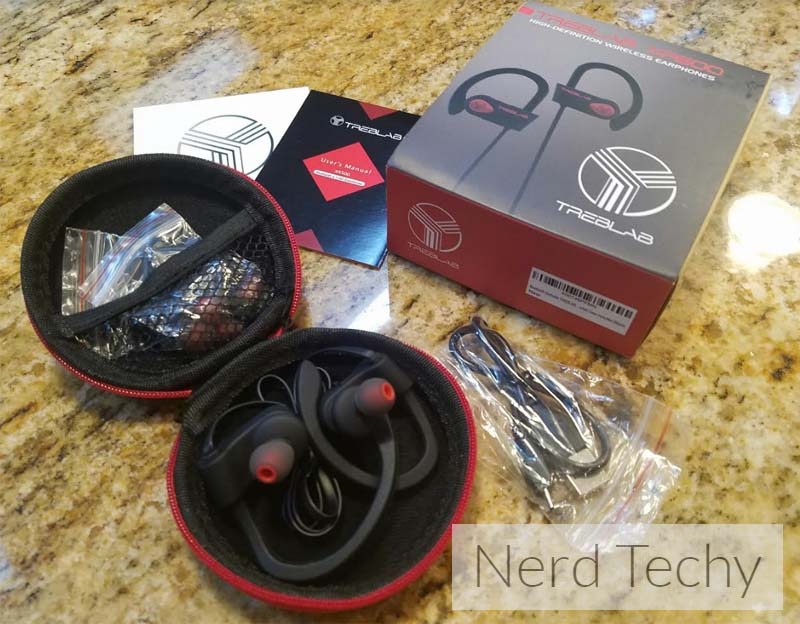 The Treblab XR500 Bluetooth earbuds are very well made, and were specifically designed for users who will be on the move with them. Because they’re so lightweight, they won’t break when dropped. They have a simple design perfected to stay put on your ears, so there are no stress points to make them vulnerable, and there is no risk of them falling out. They are even water and sweat resistant, which is particularly important for any active user. With the Treblab XR500 Bluetooth earbuds, you don’t have to hold back. Sweating won’t cause them to fall off or get damaged. 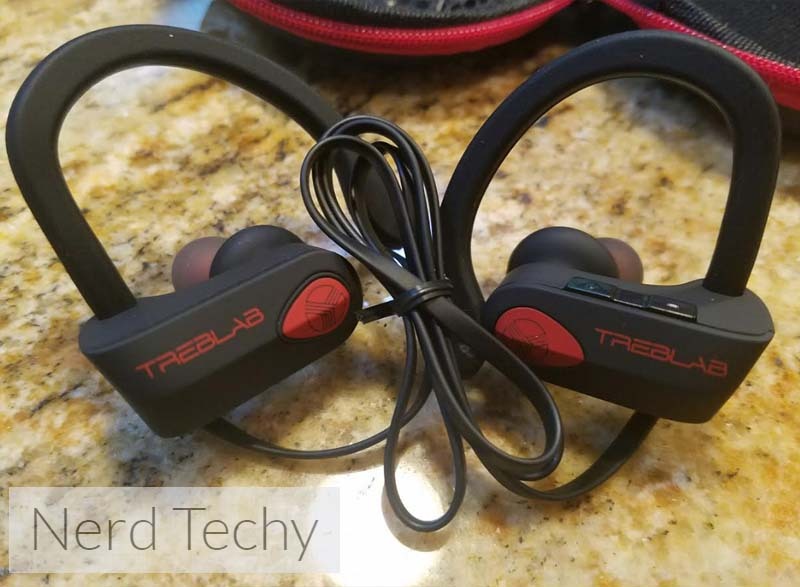 The last thing you want is for you hard work to damage your earbuds – that’s why the Treblab XR500 Bluetooth earbuds can keep up with any athlete. Unfortunately, there’s one small downside to the Treblab XR500. Unlike wired headphones, they need to be charged. Thankfully, this is a minor inconvenience due to their extensive battery life. When fully charged, they offer a whopping 9 hours of battery life; long enough for you climb a mountain, listen to an entire Pink Floyd album at the peak, and slow things down with some slow jams on your way home. Perhaps one of the best features of all is the driver size. There are many headphones that advertise incredible battery life, but once you get them out of the box you realize that this is only true if you are listening to them at half volume. With the Treblab XR500, the driver size is small enough that you can still enjoy long lasting battery life at any volume. Have you ever had to pay $6 for earbuds on an airplane, only to decide that had you been given the chance to try them first, the airline couldn’t have paid you to use them (no matter how long your flight was)? That feeling of tragically low value for something desperately needed is all too familiar for anyone who’s ever bought earbuds on a “need right now” basis. Final Words – Worth Buying? For many people, this will be an obvious choice. If you’re on the go, there are very few earbuds that can offer the same range of features provided by the Treblab XR500 Bluetooth Earbuds. The sound quality is excellent, the wireless functionality works well, and the battery life is impeccable. However, these headphones won’t be for everyone. The sound quality is great, but that’s not to say that they’re the best out there. If you’re not particularly athletic but still want a pair of portable Bluetooth headphones for day to day use, you may want something a bit heavier duty. 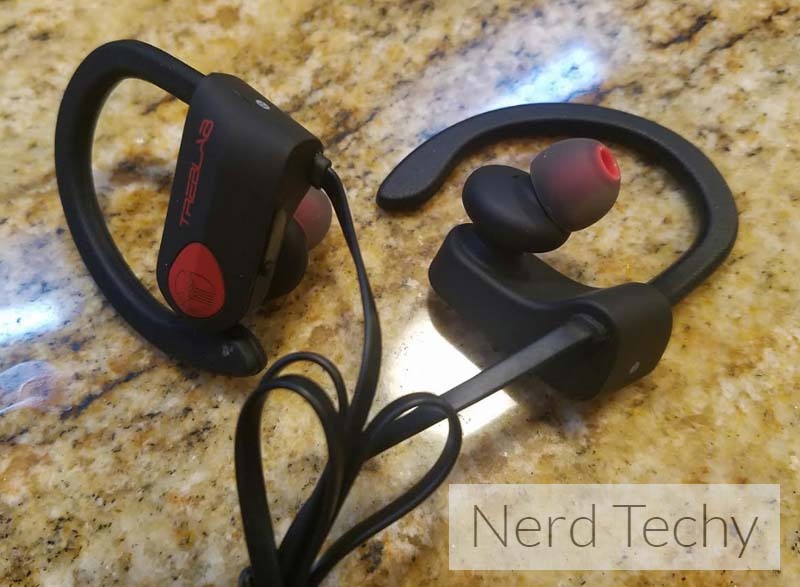 For anyone else who requires a headphone that strikes a perfect balance between portability, durability, audio quality, and affordability, you won’t find much better than the XR500 earbuds. Excellent review! In an age where anyone can review technology (ahem…Amazon reviews) it’s hard to find good reviews. So many reviews are based on “feelings” or on “bad shipping time”. Thank you for well rounded review. I need something for air travel. And I’m tired of cooking my ears in my Bose earmuffs. These seems to fit the bill. Nicely done. Thanks for your comment. We’re very glad that we could help you in your decision to go with the Treblab XR500’s. Sometimes those big bulky “over-ear” headphones are too much when portability is necessary or drastically needed. Besides the waterproof. How does it differ from the xr100? I have a Tomtom spark cardio with music and the XR500 sounds like a fit however, one site mentioned that my watch should have a wireless headphone having at least BT 4.1, A2DP compliant and a range of 128 kbps. Do you know whether this headphone have the following specs? If I have the radio on in my SUV, could my children use these to Bluetooth music from the radio to the earbuds? The SUV does have Bluetooth capability in the radio system. I don’t like hearing the kids songs on long drives and trying to find alternative for them to be able to hear it without me having to turn the radio up so loud. Does it have “previous track” and “next track” buttons? where is the skip or back pause/play? I bought them base upon your recommendation. You were correct. They are great. Thanks! How long is the range like if i go into the to the other room 100 yrds away would they still connect? I bought some of these last December and loved them. Just had an issue where they were not charging fully as I use them every day. Replacement was free of charge and no hassles whatsoever. Love these headphones, sound is great and warranty service was excellent! between these and the rf100’s, which would you pick? Does it have an off/on switch? Opinion on passive noise cancelling?